Captive Insurance is a formalized corporate structure, whereby a business self-insures a portion of identified business risks, rather than purchasing coverage from the retail insurance marketplace. Insurance can be a very profitable business. However, as with any business or adjunct to an existing business, the insurance field contains many pitfalls. If the business of insurance is not undertaken in a carefully planned, managed, and professional manner, the result can have severe ramifications for the parent company. Nearly every Fortune 1,000 US company owns a captive insurance company. Presently, the captive insurance industry is experiencing its greatest growth within “middle market” companies. These businesses are evaluating and deciding to form their own captive insurance company. A nonlife insurance company with net written premiums, or direct written premiums, not in excess of $1,200,000 in the tax year to be taxed, at regular corporate rates, only on taxable investment income, instead of being taxed on both investment and underwriting income. For tax years beginning after Dec. 31, 2016, the $1,200,000 maximum amount of annual premiums will be increased to $2,200,000. The $2,200,000 maximum amount of annual premiums will be adjusted for inflation. A specific election form must be attached to the US corporate tax return in the year the election is to take effect. The election can only be revoked with IRS permission. For those insurance companies that are organized and domiciled outside of the United States that wish to make an election pursuant to IRC 831b, they must first file an election pursuant to IRC 953(d), and obtain IRS approval to be taxed as a US entity. Special compliance and filing rules must be followed in order to obtain IRS approval of the IRC 953(d) election. “The gross amount of premiums received by a non-life insurance company for directly issued (not reinsurance) insurance policies and net assumed and ceded out reinsurance. These are but two insurance terms or phrases that are not defined by the IRC or regulations; one must “infer” the definitions by analysing numerous court case decisions, IRS revenue rulings and Private Letter Rulings. Of particular note: A company that elects to be taxed only on investment income pursuant to IRC 831(b) may not deduct underwriting losses. For this reason, companies that qualify for the alternative tax may prefer to forego the election and be taxed on both investment and underwriting income (and loss). Each and every captive insurance company, regardless of size, has very specific facts and circumstances that pertain to their insurance business activities. Accordingly, a complete feasibility study and analysis is absolutely necessary before entering into this endeavour. To do so without one is inviting calamity to have a seat at your executive board. Another prime example of a common pitfall one must be aware of is that when electing IRC 831(b), the premiums written by all members of a controlled group are aggregated to determine the amount of premiums written by any member of the group. A 50% ownership test is used to determine if a controlled group exists. In addition to the positive enhancement of the IRC 831(b), which increases the premium limit to $2,200,000 as of 1/1/2017, very specific diversification rules and requirements also go into effect. For tax years beginning after December 31 2016, a diversification requirement will apply if a nonlife insurance company makes the IRC 831(b) election. An insurance company does not have more than 20% of the net premiums (or, if greater, direct premiums written) of the company for the taxable year, which is attributable to any one policyholder. In determining the attribution of premiums to any policyholder, all policyholders who are related (within the meaning of Code Sec. 267(b) and Code Sec. 707(b) , or who are members of the same controlled group, will be treated as one policyholder. No person who holds an interest in the insurance company is a “specified holder” (see below) who holds (directly or indirectly) aggregate interests in the insurance company that is more than a “de minimis” (see below) percentage higher than the percentage of interests in the “specified assets” (see below) with respect to the insurance company held (directly or indirectly) by the specified holder. (A) A “specified holder” is, with respect to any insurance company, any individual who holds (directly or indirectly) an interest in the insurance company and who is a spouse or lineal descendant (including by adoption) of an individual who holds an interest (directly or indirectly) in the specified assets with respect to the insurance company. (B) “Specified assets” are, with respect to any insurance company, the trades or businesses, rights, or assets with respect to which the net written premiums (or direct written premiums) of the insurance company are paid. (C) An indirect interest is any interest held through a trust, estate, partnership, or corporation. (D) Except as otherwise provided by IRS in regulations or other guidance, 2% or less is treated as de minimis. A captive insurance company (“Captive”) will not meet the requirement that no more than 20% of its net (or direct) written premiums are attributable to any one policyholder. Captive will have one policyholder, “Business,” certain of whose property and liability risks Captive covers (the specified assets), and Business will pay the captive $2 million in premiums in 2017.
Business will be owned 70% by a father (“Father”) and 30% by his son (“Son”). Captive will be owned 100% by Son (whether directly, or through a trust, estate, partnership, or corporation). Son is Father’s lineal descendant. Son, a specified holder, will have a non-de minimis percentage greater interest in Captive (100%) than in the specified assets with respect to Captive (30%). Therefore, Captive will be not eligible to elect to make the election. If, by contrast, all the facts were the same, except that Son will own 30% and Father will own 70% of Captive, Son would not have a non-de minimis percentage greater interest in Captive (30%) than in the specified assets with respect to Captive (30%). Therefore, Captive would meet the diversification requirement for eligibility to make the election. The same result would occur if Son will own less than 30% of the Captive (and Father more than 70%), and the other facts remained unchanged. Every insurance company that will have an election in effect under IRC Sec 831(b) for any taxable year after 2016 will also have to furnish to the IRS, at the time and in the manner as the IRS prescribes, the information that the IRS will require with respect to the diversification requirements. As a CPA with a depth and breadth of experience and knowledge in the matter, it is my considered opinion that a captive insurance company can be a powerful tool in the risk management and business strategy of a business. It is, and always has been, the intent of The United States Congress and The United States Treasury that the primary purpose and intent of a captive insurance company is to assist in the risk management of a business, but it is filled with many complex accounting, regulatory, tax, and business issues that require one to retain knowledgeable and experienced professionals to keep the company away from “land mines” and “pitfalls”. Please feel free to contact me for clarification, direction, or dialogue on the subject of Captive Insurance for business or any other strategic compliance and planning questions and needs. With more than 25 years of experience, David is considered an expert in the specialty niche of captive insurance. David and his associates provide captive insurance audit, tax, representation and consulting services for over 200 captive insurance companies. In addition he provides services to the areas of manufacturing, distribution, nursing homes, real estate, internet and international tax compliance. 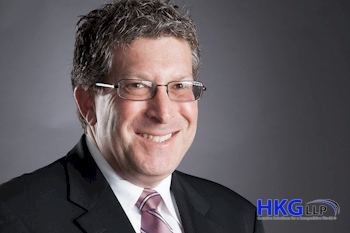 David founded Liptz & Associates 15 years ago and built the firm into a position to merge with HKG in January 2013. David prides himself on providing pro-active "wealth preservation" strategies for his clients. Additionally, he provides tax consulting and representation to businesses in IRS audit disputes. He frequently speaks at captive insurance educational seminars and other industry events.